Our flight from Belize City to Independence (the little airport for Placencia) was in one of the tiny Maya Island Air planes. 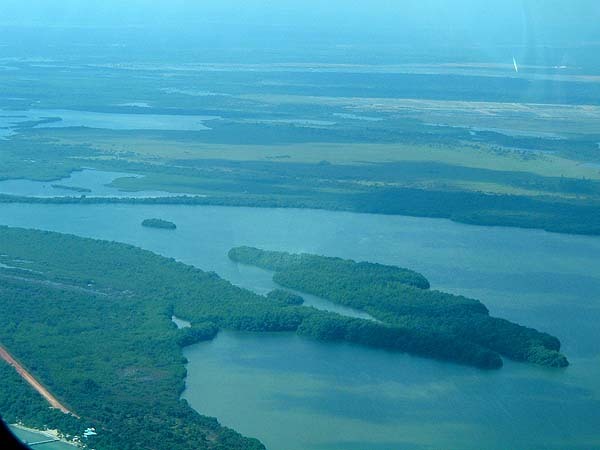 During the flight we had fantastic views of the coastline, rain forest and swamp which covered much of the landscape. It was perfect habitat for the tapirs, jaguars, crocodiles, monkeys and parrots that occur there. Of course I was more interested in the coastline and clearly most of the extensive saltwater lagoons were thickly lined with mangroves ideal snook and tarpon habitat we thought. Both Steve and I were surprised to see extensive, man made systems of rectangular ponds, often in very isolated situations. 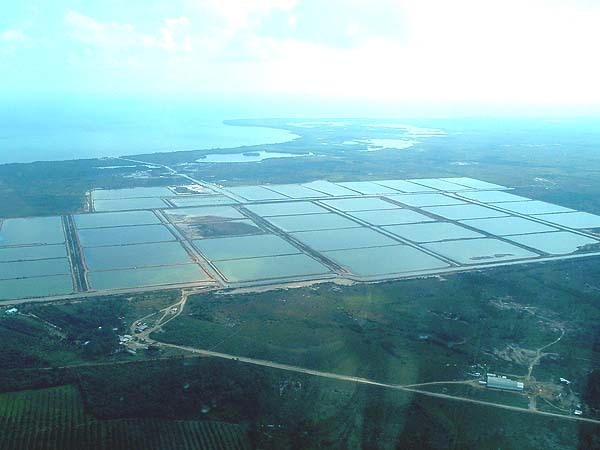 We later discovered that these were shrimp farms and must be responsible for a fair bit of degradation of the marine habitat. 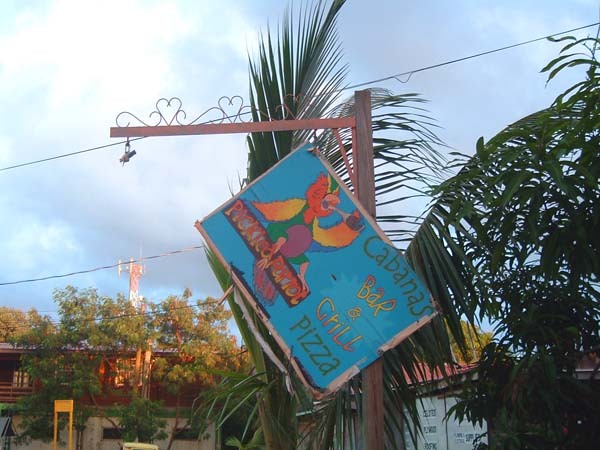 In Placencia, where we stayed, I've already mentioned that there were some 'off the wall' eating places. One of the better known ones is the 'Pickled Parrot' aptly named I thought when we found the sign hanging by one corner. Although we tried hard to catch fish our first days were limited to small barracuda, a lizard fish and a range of small snappers etc. It was on the third evening after we had eaten our evening meal that the first real fishing event took place. It was my wife Lilian (a non angler I should say) who cracked it. She'd wandered outside to watch the glow worms flashing in the darkness and came in to tell me that there was - "something splashing in the lagoon." I grabbed a torch and went down to find that, in total darkness, some sort of predatory fish were slashing at bait and making a great commotion. I grabbed my lighter spinning rod, tied on a Maria Chase plug (chartreuse and silver but I guessed that the lurid colours would not matter in the darkness). The first two casts just about reached the area of splashing and were retrieved untouched. Third cast 'wallop' I was into a fish and it tore about like a mad thing in the blackness. I played it for a minute or two before Steve was able to catch it in the beam of the torch - a horse eye jack. The jack was landed, photographed and returned. Shortly afterwards I had a second jack which fought even harder than the first. 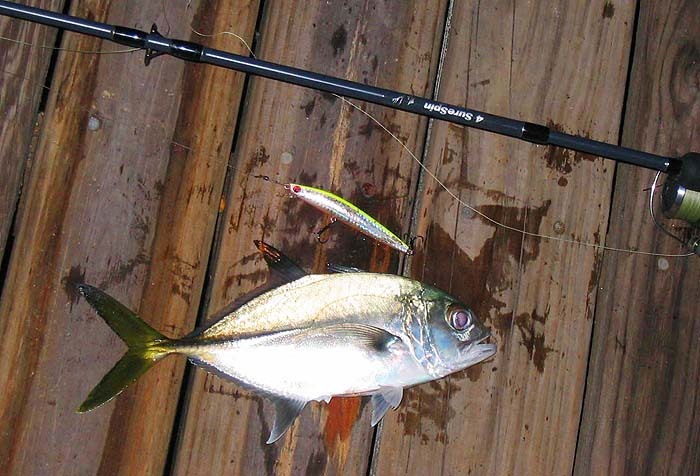 These were only smallish fish but they had all the power and tenacity of the big ones. Cracking sport. The following evening we took the fly rods out to try and repeat the exercise but, in the way of fish, the 'blitz' was much less obvious and we only managed one jack on a plug cast by Steve's wife Lyn. Our second week was spent at Monkey River and I'll say a bit more about it later but again we were living in an apartment at the edge of the sea. 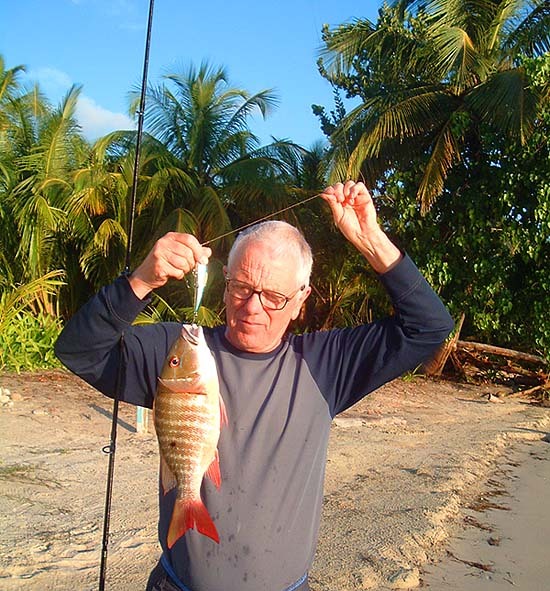 On the evening after we arrived I spun from the jetty outside the house and landed a decent mutton snapper on the plug. Even these rather wrasse-like fish fight like demons on the spinning gear and I was well pleased with my catch. Horse eye jack in the dark.